You can create UML project for any of your Java project in Android Studio. Note that one Java project can associate with at most one UML project and you cannot create UML project without associating it with any Java project. Once you have created a UML project for a Java project, you cannot remove it or de-associate it. In Android Studio, select the Java project where you want to create a UML project for it. 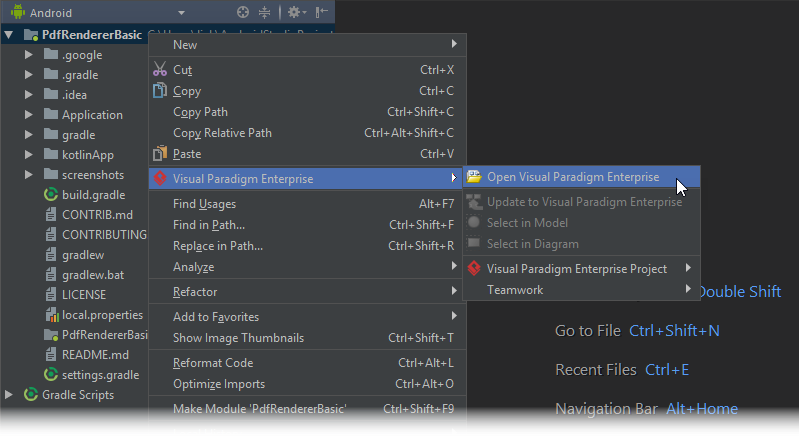 Right click on the project and select Visual Paradigm Enterprise > Open Visual Paradigm Enterprise from the popup menu. Select from the Project Structure window the location of the Visual Paradigm project is to be saved. The Visual Paradigm project, with .vpp extension, is the UML project file that is going to be associated with the selected Android Studio project file. 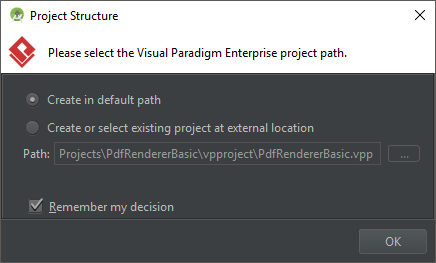 Select Create in default path will save the UML project to %Android Studio_Project_Directory%/vpproject while selecting Create at external location require you to specify the project path you desire. If you want to create in default path for all projects, check Create in default path and Remember my decision. 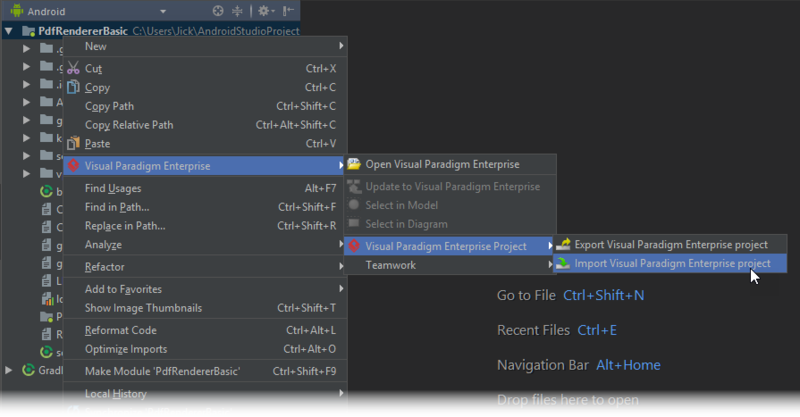 Right click on the project and select Visual Paradigm Enterprise > Visual Paradigm Enterprise Project > Import Visual Paradigm Enterprise Project… from the popup menu. Specify the path of source .vpp project as well as the location of the imported project file is to be saved. 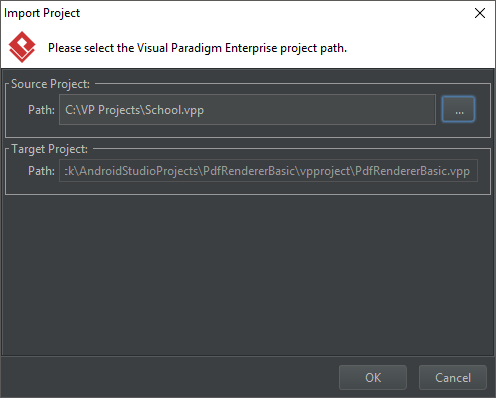 Select Create in default path will save the UML project to %Android Studio_Project_Directory%/vpproject while selecting Create at external location requires you to specify the project path you desire. If you want to create in default path for all projects, check Create in default path and Remember my decision.